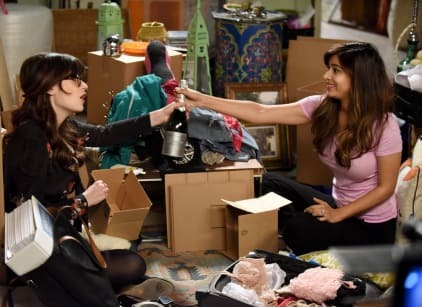 On New Girl Season 5 Episode 11, Jess helps Cece move out of her old apartment, but things take a turn for the worse when Jess realizes Cece hasn't even prepared to pack. Jess tries to get Cece to create two separate piles of things, one to throw away and one to take, but Cece can't seem to make up her mind. Jess finally gets an idea to throw Cece out of the apartment so she can get things done quickly because Jess also has to finish the budget report for her school. Cece and Jess soon have a heart to heart and Cece admits she's afraid of all the changes. Jess is able to ease her mind after mentioning all the good things about Schmidt. Cece also gives Jess advice to leave her job at the school because the new principal is taking advantage of her, but Jess doesn't want to be unemployed. When Jess's boss Becky calls, Cece picks up the phone and tells her Jess quits which puts Jess in an awkward situation. Jess later goes to Becky and apologizes for the misunderstanding, but Becky tells Jess she never took her seriously which only angers Jess. Jess ends up making up her mind and officially quitting. Meanwhile, Winston can't handle being around Aly while she talks about her boyfriend so he asks for a new partner. Unfortunately Winston's new partner, Dunston, isn't the smartest person and Winston realizes he misses Aly. Eventually Winston and Aly get back together as partners, but Winston still hasn't revealed how he really feels about her. Don't feel bad if you missed out! You can watch New Girl online now via TV Fanatic. It's not mine. I only buy local except for clothing and produce, medication, water, seasoning, meat. It's too small to be a cat hotel and too big to be pants so it can't be mine. Permalink: It's too small to be a cat hotel and too big to be pants so it can't be mine.